LAKEVILLE, IN. 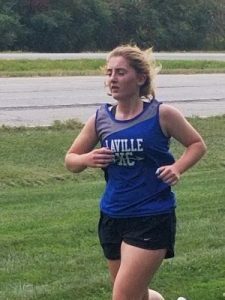 – The varsity co-ed cross country team hosted South Bend Career Academy and Argos in a triangular meet. Argos had the only full team and won the boys team event. Prior to the meet, LaVille Cross Country Coach Erin Ecker paused to acknowledge senior Eve Miller for her dedication to the program. Miller later finished third. 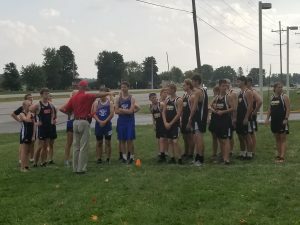 Individually for LaVille, Caleb Christy finished third out of 15 runners, while Connor Henry Finished fourth. Christy finished the 3.1-mile course in 23-minutes, 53-seconds. Henry made his run in 24:04. The overall winner was Aiden Manges of Argos 21:35. In the girl’s event, the Lancers finished 1-2-3. Faith Rock was the overall winner. Airyona Nies finished second and Eve Miller wrapped up her final senior night performance with a third place finish. Rock won the event in 26-minues, 30-seconds. Nies in 28:59 and Miller 29:27. LHS will travel to Winamac for a triangular meet with Triton on Tuesday, September 25. The event is scheduled to begin at 5 p.m. The Hoosier North Athletic Conference Co-Ed Cross Country Championships will be Saturday, September 29, at Winamac. The conference championship, which includes high school and junior high, is set to start at 11:30 a.m.